Stepping Stones Project seeks to improve cognitive and behavioral development of young children using enhanced ECD curriculum, technology, and community engagement. How we delivered the innovation? 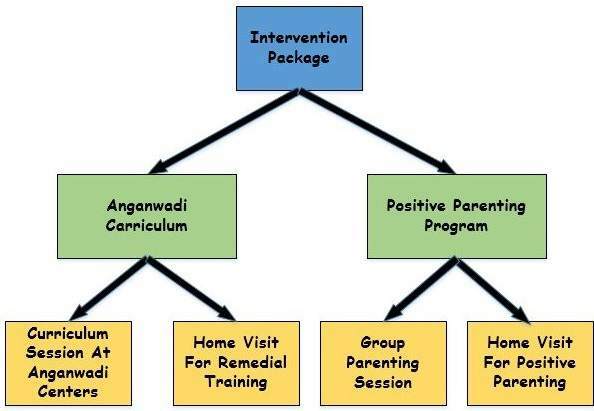 The key components of our intervention package were Enhanced Anganwadi Curriculum and Positive Parenting Programme. The Anganwadi curriculum was delivered through Anganwadi workers specially trained by project for Enhanced Curriculum and was supported with hand holding activities by Project staff and Private Preschool teachers. Curriculum included neatly framed, locally adapted, age appropriate ECD activities organized in 31 weekly subjects with a specific assessment format for performance of the child in each week. The weekly assessment data was analyzed every week and children needing “special attention” were identified. Such children with “special attention” were given “Remedial training” through Personalized home visits. Progress of individual child was tracked using Smart Register Application. Total 327 children aged 3-6 years were benefited through Enhanced Anganwadi Curriculum. Similarly, Positive Parenting Package included eight well framed, locally adapted Parenting Sessions which were delivered in Group Meetings and also through personalized home visits with special emphasis on families with “Special Needs”. Families with “Special Needs” included families with child having single parent, families in remote, difficult to reach areas, addicted parents, very poor families and illiterate parents. Positive Parenting Group Sessions were interactive sessions with parents showing self-reflection about child care and development. Positive attitudes and behaviors were promoted at community level using technology based activities like Photovoice. Total 685 parents and caregivers of 548 children aged 0-3 years were reached through Parenting programme.